FORT LAUDERDALE, Fla., Feb. 14, 2018 -- Fort Lauderdale, FL, February 9, 2018 -- 71lbs, the nation's fully automated, human-backed FedEx & UPS shipping refunds service, announced their latest addition to the Intuit Developer Platform. 71lbs was added to the Quickbooks Online Apps store offering a shipping refunds service for their customers shipping with FedEx & UPS. 71lbs, a 5-Star rated app on QBO, helps over 5,000 customers receive, often unexpected, shipping refunds back to their shipping accounts. 71lbs' suite of refund services includes late delivery refunds, auditing for invoice errors, as well as lost/damaged refund claims. 71lbs is the customer's Shipping Advocate. "The 71lbs shipping refunds service has helped hundreds of Quickbooks customers receive thousands of dollars in FedEx & UPS shipping refunds. 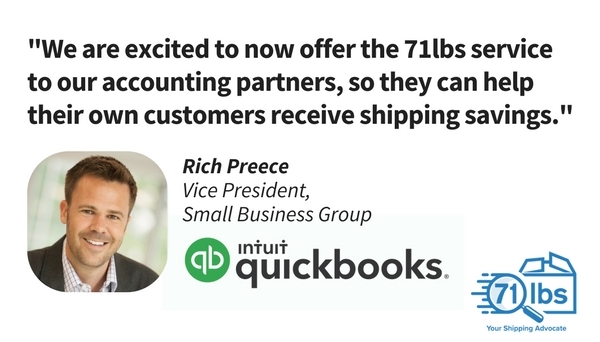 We are excited to now offer the 71lbs service to our accounting partners, so they can help their own customers receive shipping savings", said Rich Preece, vice president, Intuit QuickBooks Small Business Group. "71lbs has been a great QBO app to us. Not only did 71lbs get me over $500 in refunds for the year, but by using their Shipping Analytics dashboard, I was able to successfully negotiate a better shipping discount from 18% to 29-39%. I tell everyone, 'Friends don't let friends ship anything without having 71lbs!' They do what no business owner has time to do - watch every penny going to another vendor and make sure that it has been earned. I am busy working on my business, 71lbs works on my found monies!," states Patrick Mobley, business owner of PBMOBES, a QBO merchant. 71lbs' contingency-based service means QBO customers do not pay any sign-up or monthly fees. If 71lbs saves a customer money with their refunds service, their fee is earned on a shared-savings model. Over $2 billion in shipping refunds are left unclaimed every year. Hundreds of QBO customers have already signed up with 71lbs and received hundreds, if not thousands, of dollars every year in unexpected shipping refunds. "Joining the QBO Apps store adds to our mission of helping democratize shipping for small & medium companies," said Jose Li, CEO & Founder of 71lbs. "We are excited about helping QuickBooks accounting partners support these small/medium size businesses with the two biggest pain points as it relates to shipping: a) saving money on shipping and b) helping merchants understand their shipping costs."